AVI or MKV? I am downloading movies from the internet and i have 2 options to choose from : The AVI format and The MKV format. Is there any quality difference ? And why do you think they have offered these 2 formats if there is actually no difference between them ? Do you have the same puzzle about MKV and AVI? If so, then follow me and I will tell you the differences between MKV and AVI and show you their respective pros and cons. MKV, the short form of the Matroska Multimedia Container, is an open standard free container format capable to hold innumerable videos, audios, pictures, or subtitle tracks in one file. Also it carries out its duty as a universal format to store common multimedia content, e.g., movies, TV shows, etc. AVI, (also Audio Video Interleave), widely called AVI by its initial letters, is a multimedia container format as well, introduced by Microsoft in November 1992 as a counter from Windows software against MOV format from Apple computers. AVI files can contain both audio and video data in a file container inside which synchronous audio-with-video playback can be achieved. MP3, WMA, AAC, AC3, DTS, RealAudio, PCM, etc. MicroDVD, MPEG-4 Timed Text, MPSub, Ogg Kate, Ogg Writ, etc. 1. MKV is an open standard free container format while AVI is a proprietary format from Microsoft. 2. In addition to the common codecs, MKV supports H.264/AVC and HEVC/H.265, which are not supported by AVI. H.264 and H.265 are two major codecs for HD and 4K UHD videos. 3. AVI may support multiple video or audio streams based on the codecs, while MKV is able to store multiple tracks of audio, video and subtitles. 4. AVI is a common video format supported by many video players, mobiles, online sites due to its simplicity, and MKV is not suitable for average users who don't need all the features of the format. 1. Both MKV and AVI are container formats that can store audio and video data. 2. AVI can be a large file due to its minimal compression, and MKV can be larger as it holds multiple streams. Grounded on MKV and AVI individual pros and cons, there are several suggestions for you when you are in a dilemma to choose one from MKV and AVI. One: supposed you are the one who pursue a better format compatibilty and play your videos almost anywhere, AVI should be your preference with no doubt. Two: in case the video quality is what you care about most, then picking out MKV is unquestioned as the most sensible choice since MKV can store the HD movies with highest possible quality. After the MKV vs AVI review, read this part if you also need to convert or compress the two formats. 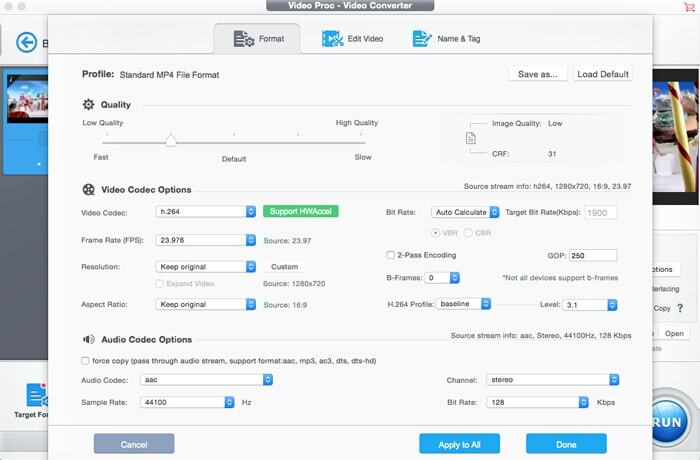 If you can't play MKV or AVI smoothly on anywhere, or can't stand the large file size, this MacX Video Converter Pro can help. 2. You can also convert video to Apple iPhone 6/6 Plus/6S/7/8/X, iPad Air 2/mini 4, iPad Pro, Galaxy Note 9/S9, HTC, Sony Xperia, Surface Pro 4, Kindle Fire, etc. 3. Reduce large files to 90% smaller with 98% quality reserved. 4. 3-Level Hardware Acceleration delivers the fastst speed converting videos, 5X faster than other tools. Step 1: Install the program and run it. Click Video from the interface and then click Video with a Plus button to load the file. Step 2: Then you will see a window like the image above, select an output format from the profile bar on the bottom. You can select a digital format, or mobile device. The ToolBox contains some advanced editing features like denoise, deshake, 3D-2D, make GIF, split, etc. Use it as you want. Step 3: To compress large MKV or AVI videos, click the Gear button behind the video info, where you can adjust the video settings. See the window above, you can adjust the video quality, video/audio codecs, bit rates, resolutions and many more. Also the editing features like cut and trim also help reduce video size. Step 4: After all the settings, click Run to apply the adjustment. Before that, don't forget to check the Hardware acceleration engine on the interface.